Fruit cocktail brings to mind disgusting images of grapes that don’t even look real anymore and peaches and pineapples whose original taste is not even a faint memory. I know that these canned varieties are quite popular, because there are grocery store shelves lined with various kinds of fruit cocktail, but I have an aversion to even putting them in my grocery cart much less bringing them into my house. Why even bring up such a topic, you ask? I have been thinking about the many, many big meals and even bigger dessert spreads I will be eating over the next few weeks and it reminded me of a dessert that seems so appropriate to share. Several years ago, I was asked to come up with a “thinning” dessert. I remember having a sense of panic as my mind usually does not think along those lines. Don’t get me wrong, it is not that I set out with the goal of creating a dessert with the highest calorie count imaginable; it is more that I do not think about calories at all…EVER. Freud would absolutely have a great time with me, but that is most definitely a subject for a different discussion. Lest you think that I only eat candies, cakes, cookies or any of the other fabulous categories listed on Desserts Required, you should know that I love fruit, just not out of a can or container. I don’t even have to put fresh fruit in a pie or cake to be completely satisfied. An orange dessert sauce was the perfect addition to an enticing “cocktail” of fruit. It is a light sauce with just the right amount of orange flavor to it, as both the juice and the zest are used. So as we eat our way through the next few weeks, raise a glass of Fruit “Cocktail” with Orange Sauce and toast to your cleverness. Combine all of the Orange Sauce ingredients in a medium size saucepan. Cook over medium heat, stirring constantly, until creamy and simmering, about 10 minutes. Do not boil the sauce. Transfer to a separate bowl and immediately place a piece of wax paper directly onto the surface of the sauce. Cool completely at room temperature and then refrigerate until cold, several hours or overnight. Wash the strawberries, grapes and raspberries separately. Hull the strawberries. Dry the grapes. Drain the raspberries on paper towels. Peel, slice and halve the kiwis. Cut the pineapple into bite size pieces. Slice the grapes in half. Place 3-4 orange sections in each martini glass, angling them out from the bottom. Slice strawberries and place them in the glass around the orange slices. 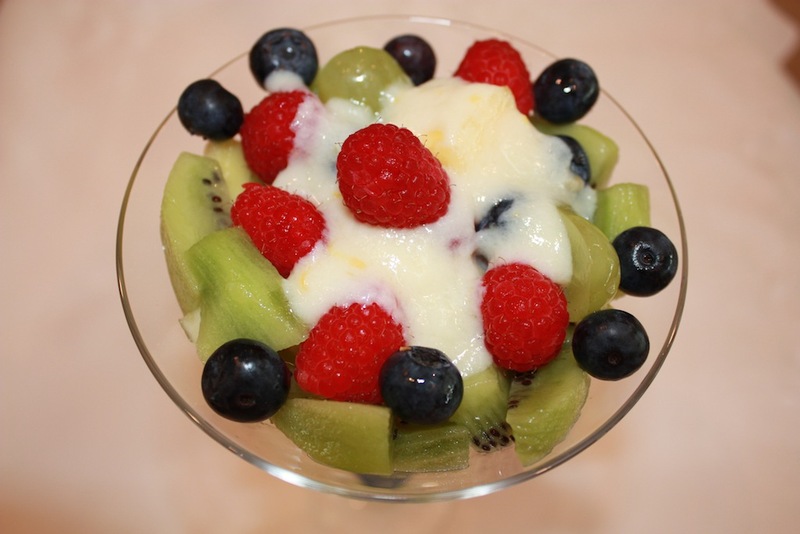 Add a layer of pineapple, grape slices, kiwi, banana slices and raspberries. Spoon the Orange Sauce over the fruit and top with a few raspberries. Serve immediately, passing additional sauce if desired. The fruits selected for the Fruit “Cocktail” are limitless. Choose what is fresh, ripe and appealing to you. The amount of fruit needed is dependent on how many people are being served as well as how the fruit is being presented. More fruit is needed for a fruit platter than for individual martini glasses. The Orange Sauce recipe may be halved if serving a small group. Finally, a fresh fruit recipe that is a bit different then the cut up fruit one can buy at the grocery store. How many times have we all been served the “healthy” dessert of fresh fruit and wished for a bit more. Great job Betsy!